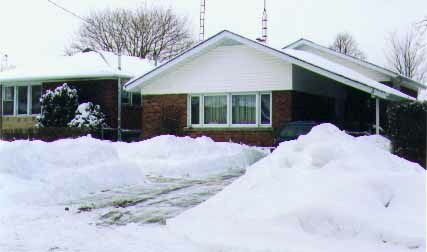 We were snow bound in January 1999. By the middle of the month we had four feet of snow in the front yard. 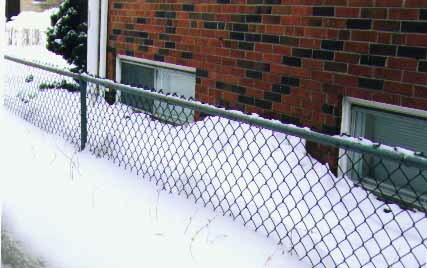 Since my friends from down under really enjoy looking at the snow photographs, I have decided to keep them up. 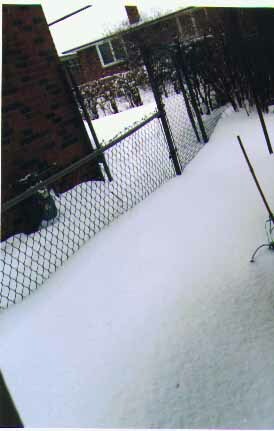 We hardly had any snow to speak of this year, 1999 was enough for me. This is our neighbours hedge in the summer. Host of Hostas towards back yard . Host of Hostas towards the roadway. Klaus after digging shoulder high snow. Me knee deep in snow. as we had to move the plants that where in the pond. Klaus Received this really sweet gargoyle from our friends Herbert and Ann on the occasion of Klaus's 60th Birthday. Cedric as we call him had now moved out of doors. Charlie and Mabel the terracotta people had to move indoors as they would have cracked. I will have a diagram and directions how to do them in Arts and Stuff. A close-up of our Easter Egg tree. My Anniversary present from Klaus. Klaus and I have had a very eventful summer that lead to a very different winter that I had planned. I wanted to do trays for the ladies of the family but because of my operation. It was a no go. It was the longest time before I could sit any length of time in one place. I don't recommend emergency appendectomy leading to peritonitis and a collapsed right lung. Even after having the flu shot I caught some kind of flu that lead to bronchitis and a hernia from coughing so much. It is Easter and I am just getting back to normal. So instead of doing really interesting stuff like travelling. Klaus and I have had to stay at home after his retirement. He had decided to take it after what happened to me. Well we have been doing projects in the house like putting up trim on the doors on the kitchen cabinets. He put down a new floor too. In between he started a website building business Toronto Web Solutions Inc.
Then he tackled the bathroom putting lovely white ceramic tiles on the vanity sink top. I have started redoing the web pages and start up a whole new site devoted to art and stuff. I will be doing a lot more of that in the future. I finally got the nerve to put up my poetry with my own paintings used as backgrounds and borders. I you would like you to go there and see what I have been up to. Come visit my pages. I would love to show what I have been up too. This is a photo of Klaus looking cold after all his digging.